Amazing in attack, rubbish at the back. The talent to beat any team and the capacity to implode at any moment. A total mess in the boardroom. Did Wenger really go? Arsenal’s first season without Arsène Wenger since 1995-96 was always going to be a difficult campaign and, as in the post-Ferguson era at Manchester United, there was always the possibility it was going to end in disaster. Off-field developments this week suggest that the Gunners are running into similar structural problems as United, and now seem to be heading towards a cliff edge. There seems to be no way to avoid a second overhaul in two years and another fresh start in the summer. They’re still light years from being a team that can challenge for the Premier League title and even Champions League qualification seems to be beyond them. This time last year Chief Executive Ivan Gazidis, Head of Recruitment Sven Mislintat and Head of Football Raúl Sanllehi appointed Unai Emery as Arsenal’s first new manager in 22 years. They seemed to have put together a modern, coherent and streamlined model with a clear division of labour and authority. Twelve months on, Gazidis has moved to AC Milan and Mislintat, described as “the signing of the century” after his arrival from Borussia Dortmund, has quit over disagreements regarding methodology. Arsenal have effectively gone from having the perfect off-field setup to having to fashion a new one which simply keeps the wheels turning. The treatment of Arsenal’s key players also raises huge doubts over decision-making and allocation of resources. Mesut Özil and Aaron Ramsey have been frozen out, with Ramsey’s contract being allowed to expire. The Welshman, arguably more a symbol of Arsenal than any other player at the club, has since signed a pre-contract agreement with Bosman-market kings Juventus. Özil, by a distance Arsenal’s highest earner and awarded his latest deal just last summer, is now reportedly up for sale. With the likes of Alex Iwobi and Mattéo Guendouzi racking up minutes in their places, it’s impossible not to wonder who’s calling the shots at Arsenal and what their thinking is. On the pitch, results aren’t justifying such weird decision-making. Arsenal are fifth, six points outside the Champions League spots. They haven’t really played well for any sustained period this season – even while going unbeaten for 22 games in four months across all competitions, they never produced the football they’re capable of or even a single complete performance. Since the end of that unbeaten run one month ago, they’ve lost to Southampton (3-2), Tottenham (2-0), Liverpool (5-1) and, last weekend, West Ham (1-0). Obviously, they weren’t going to shake the flakiness of the tail-end of the Wenger era overnight, and it would be unfair to say that successful steps towards forging a new identity haven’t been taken this season, but the last few weeks’ results have served to remind us exactly how difficult Unai Emery’s job is. Arsenal’s implosion at boardroom level will only make Emery’s life even harder. First and foremost, Arsenal need to decide where the power lies at the club and start planning in a way that makes sense, makes the most of their squad and their financial resources, and minimises waste. They risk losing Gazidis, Mislintat, Ramsey and Özil in a single season, just a year after losing Alexis Sánchez and, of course, Arsène Wenger. That would leave a vacuum that could be impossible to fill. On the pitch, results have to improve and, by the end of the season, performances have to have become more fluent, polished and consistent. 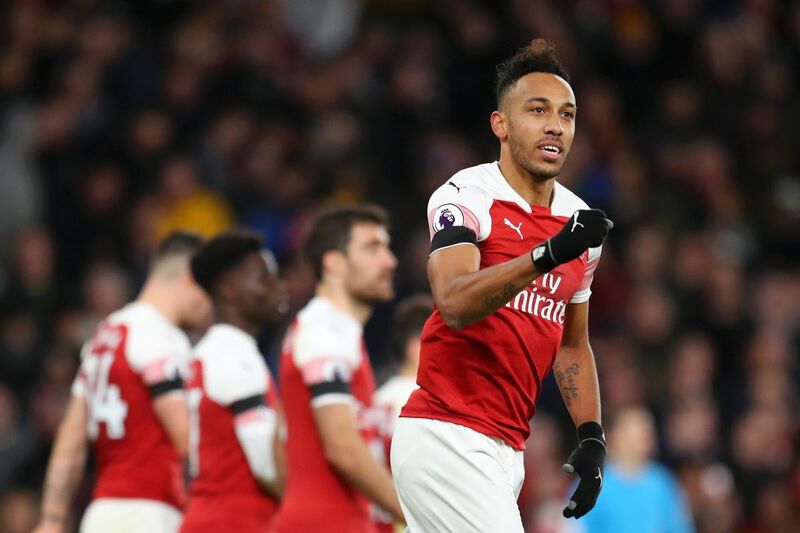 At the moment, only Pierre-Emerick Aubameyang can say he’s maintaining his high standards every week. Lucas Torreira has impressed without playing to his absolute maximum on a regular basis, while both Ramsey and Alexandre Lacazette can say they’ve had good spells of form when allowed to play. Everyone else has had good days and some truly rotten ones. In short, it’s still not clear what the new Arsenal’s identity is or how they’re going to play from now on. Emery’s objective should be to give us answers before May. The club’s objective should be to enable Emery to do so. In recent weeks, Emery has alternated between back-three systems and back-four ones, often within the same game. We should expect him to aim to give Arsenal a strong defensive base against the threat of Sarriball by starting with a Conte-esque 3-4-2-1 formation. Arsenal have only kept one Premier League clean sheet since September, however, and Chelsea shouldn’t expect to find it hard to break the Gunners down. In attack, Arsenal remain a pacy, technical outfit capable of prising open any defence at a moment’s notice. Aubameyang is so fast and so clinical that defending him is close to impossible. 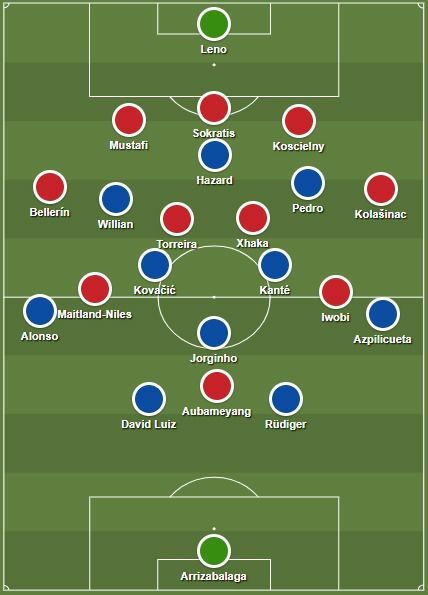 Additionally, the Gunners are adept at breaking down the flanks at speed before squaring cutbacks across the six-yard box, and Chelsea’s full backs will have to be very aware of the threat at transitions. Arsenal’s biggest threat remains their speed and their technical mastery of the ball. In Aubameyang and Héctor Bellerín the Gunners have two of the fastest players in the Premier League, while Lacazette, Ramsey, Iwobi and Sead Kolašinac are explosive runners who can open the pitch up and collapse a team’s defensive structure with a single well-timed burst into space, while each of Arsenal’s midfielders has the vision and the passing quality to find them on the move. Maurizio Sarri has two options: first, drop Chelsea’s defensive line a little deeper than usual; second, press like hell and make sure Arsenal can’t play out and use that threat. With the Blues so tired after so many games in such a short time, the second option is impossible. If Chelsea don’t show Arsenal the respect they deserve, they will find themselves with a mountain to climb. On a squad level, Arsenal’s team is hopelessly top-heavy. They somehow spent all their money on two top-level strikers who can’t play together in big games, and so many attacking midfielders that it’s impossible not to leave huge portion of their wage bill on the bench every week, leaving them with notable vulnerabilities in key areas on the pitch at all times. In defence, Arsenal remain as porous as ever: Shkodran Mustafi is positionally hopeless and gets sucked in all the time; Sokratis Papastathopoulos was a fine penalty box defender for a long time, but has been exposed as too slow and cumbersome to play in Emery’s systems; Laurent Koscielny is still recovering form and fitness after a bad injury, but let’s not forget that he’s been a part of a million different mentally fragile Arsenal defences. New goalkeeper Bernd Leno, recruited as the Gunners’ new long-term number one, was flagged up as an error-prone, below average shot-stopper by a number of stats bloggers and he hasn’t done anything to change that impression. Throughout the season, Arsenal’s world-class frontline has been undermined by their creaky defence and their callow midfield. If this happens again here, Chelsea will win. Aubameyang and Lacazette have only started together once in Arsenal’s six games against big-six opponents, so we shouldn’t expect the latter to feature until the second half. The apparently fit again Özil is pushing for a recall, and will probably be named on the bench, unless Emery feels like he absolutely needs a result here and puts personal and political issues aside for a week. As for Chelsea, we all know what’s coming. Arsenal haven’t lost at home since the opening day of the season, but they’ve only won once against their Big Six rivals this season. Neither of those facts will change this weekend. Expect a chaotic, error-strewn, entertaining 2-2. The Daily Hilario: Wine Country Your daily dose of off-topic shenanigans.